How is Same Day Teeth different from conventional treatment? Same day teeth, as the name suggests, is a technique that allows a dentist to deliver a complete set of new, functioning teeth in just one day and in some cases as little as a few hours. 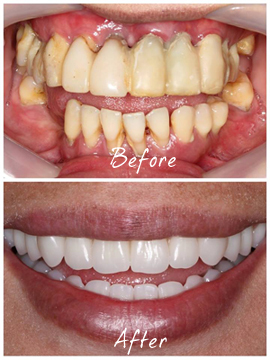 This is a treatment that has been specifically developed to minimise the ordeal of tooth loss and make the transition to replacement teeth as simple and painless as possible. This is only made possible through a close working relationship between dentist and technician, and involves the use of dental implants. This treatment is designed for those patients who have already lost all their teeth or who are going to loose there remaining teeth. Tooth loss can occur for many reasons, but most commonly teeth are lost due to gum disease. Gum disease or Periodontal disease as it is technically known, results in bone loss around the teeth. As teeth are supported by bone the result is mobility. Wobbly teeth. Once this becomes significant, there is no successful treatment and teeth may be lost. The procedure starts with careful planning. A CT scan is taken of the jaw/s. This allows the dentist to create a 3-dimensional picture of the jaws and teeth. From this it is possible to identify the most suitable areas to place dental implants. A minimum of 4 dental implants is required in each jaw to support a fixed set of teeth, however most dentists prefer to place more whenever possible. The number of implants used is determined by the amount of available bone, and an individual's anatomy. Once the number and position of implants have been decided, this information is converted into a computer generated Surgical Guide, which is used when the implants are placed to accurately guide them into position. 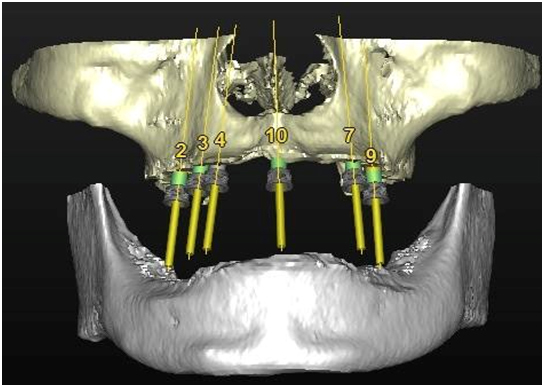 Accurate implant positioning is essential to creating a long-term, successful result. 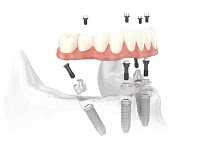 Once the implants are in place, special connectors are attached and a new arch of artificial teeth is secured (hybrid bridge). These teeth are left in place for approximately 3 months while the gums heal and the bone knits to the implants. A soft diet is recommended for the first few weeks but after this normal eating can resume. After 3 months, a new bridge is made. At this time any changes to the appearance of the new teeth can be made. The final fixed bridge is then permanently secured in place. 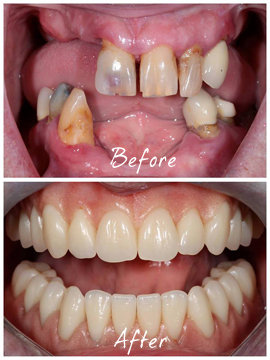 This procedure can only be carried out if there is sufficient bone to place dental implants. Sadly, some people who have experienced tooth loss at an early age or advanced bone loss associated with chronic gum disease may not have adequate bone. In cases like these, it may be possible to supplement the bone that already exists with artificial bone or bone from another area called a donor site. This is a technique know as bone grafting. When this is required it usually adds a significant amount of time to the procedure as the new bone takes several months to mature. People who smoke should be advised that they are at a greater risk of complications, such as implant failure, if they have the procedure. Conventional techniques for replacing failing teeth involve making a denture from a set of dental moulds. The teeth are then removed and the denture is fitted. The denture is termed an "immediate replacement denture" as it is placed immediately following tooth removal. As these dentures are made from moulds with the teeth still in place, the technique relies on the technician estimating the gum profile once the teeth are removed. Often, the result is a poorly fitting denture that is difficult to wear and uncomfortable. Each case is different, and the length of time it takes to complete is usually dependent on the number of teeth to be removed and the number of implants being placed. However the entire procedure normally takes between 2-6 hours per jaw. The procedure is usually carried out under a local anaesthetic and modern anaesthetics ensure that the procedure is entirely pain free. Following the procedure, there may be some discomfort and swelling, however this can usually be managed very well with normal painkillers such as ibuprofen or paracetamol. Good maintenance is essential to the long-term success of this treatment. Once the final teeth have been fitted, an appointment is usually scheduled to see the hygienist, who will discuss the best way to keep your new teeth clean. An annual visit to see the dentist is also important so that the implants and bridge can be regularly checked. Costs for this procedure vary greatly from clinic to clinic and are usually dependent on the materials used. Certain implant brands are more costly than others and a significant cost involved is components. Also, additional procedures such as 'bone grafting' can affect the cost dramatically. An average cost per arch can vary from between £12,000 - £18,000. With careful planning and surgery, this treatment is very predictable and successful and has changed the lives of thousands of patients worldwide.